Holoscenes is a multi-platform artwork colliding the human body with water. The work includes performance installation, video, photographic, and print components. 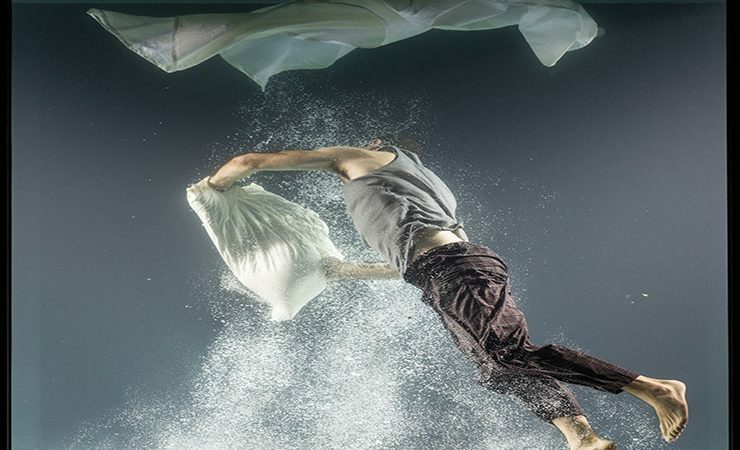 The Anthropocene Suite is a quartet of projections featuring multiple performers carrying out a series of everyday behaviors while animated by several thousand gallons of water in an aquarium-like sculpture. Their behaviors are transformed by these ceaseless mini-floods. Holoscenes is driven by the concern that our troubled relationship to water will become the central issue of the 21st century. Lars Jan was an Artist in Residence at the Center for the Art of Performance at UCULA, where he worked on the development of Holoscenes for several months. A special installation of Holoscenes was commissioned by LENS (Laboratory for Environmental Narrative Strategies) in collaboration with CAP UCLA and the Fowler Museum for the launch of LENS at Earth Now: Earth 2050, the UCLA Luskin Inaugural Symposium on 26 October 2016.